Tweaking is part of me. I perform different kinds of tweaks on my phones and PC for fun and educational purposes. One of my favorite tweaks is adding On-screen navigation buttons on my Android phones. Some years past, to achieve this, the phone must be rooted and after that, I make use of Xposed installer and other developers app to not only add these virtual buttons but also tweak the battery 🔋 icon, network signal 📶 icon, time, date, and even notification bar of my phones. Trust me, it's fun but requires some technical know-how to get it rightly. Interestingly, you don't even need to root your Android phone or install Xposed framework in order to add some of this tweaks on your device. 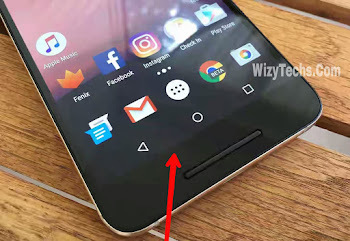 Thanks to so many applications available on Google Playstore for Android devices that now allows you perform some difficult tasks with much ease so am here to show you the simplest method to add navigation buttons on your Android phone screen. This buttons comes in handy especially when your phone physical buttons are faulty. With the On-screen buttons, you can operate your phone flawlessly without worrying about the hardware issues. Another advantage of this buttons is that it makes your phone stand out and unique. Imagine adding this buttons to your Infinix Hot Note Android phone, it will make it appear different from other Hot Notes. It will just look like some of the new Google Nexus smartphones. Oh i remember when i was using Gionee M2 back then in 2014. The phone was great then (especially the battery) but the physical navigation buttons doesn't light up so it makes it a little harder using the phone at night but when i installed the on-screen buttons, it was perfect and looked classy - different from other Gionee M2 devices. Enough of the talk, let's go straight to business. For those that are not really geeky or guru in the tweaking world, I will introduce the simplest way to achieve this without cracking your brain. Thanks to this wonderful app called Virtual SoftKeys. The lightweight app (Only 1.6MB in size) will ensure that you get the best of both worlds when it comes to your phone navigations. How do i go about it? I know this is the question running on your mind right now. But relax... It's simple, quick and easy. First of all, download Virtual SoftKeys and Install on your Android phone. After that, give it the necessary permissions by going to your settings, selecting accessibility and enabling Virtual softkeys. Now you can tweak the look and feel of your on-screen buttons and also set it to stay permanently or disappear after a duration. If this is set to duration-based, you would have to swipe up from the bottom edge of your display to bring up the buttons. Do you like this quick tutorial? Help others to know about this trick by hitting the SHARE buttons below. Meanwhile, if your phone comes with on-screen buttons, you don't need to bother yourself for this this. Go on and enjoy your device. The on screen navigation increases the user experience and makes it easier for the users to find the apps quickly. Users can even customize the notification to stay permanently or disappear after a certain time. Gotta try this out......... Krobo. wow lemme rush n do mine....nice one baba!